New immunotherapy drugs can help signal the immune system to attack. 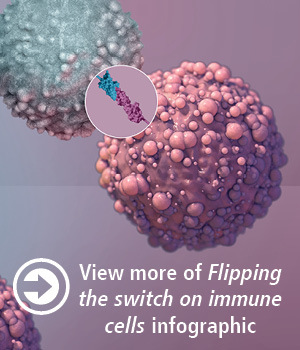 Here an individual T cell (blue) destroys a cancer cell. Rathi Pillai with her patient Danny Foshee. Patients receive immunotherapy drugs like Opdivo in intraveneous solutions delivered via infusion. Cathy McCoy with husband Joe, her doctor Ragini Kudchadkar, and research coordinator Cabell Eysmans. McCoy was the first melanoma patient to complete Winship’s combination therapy study. 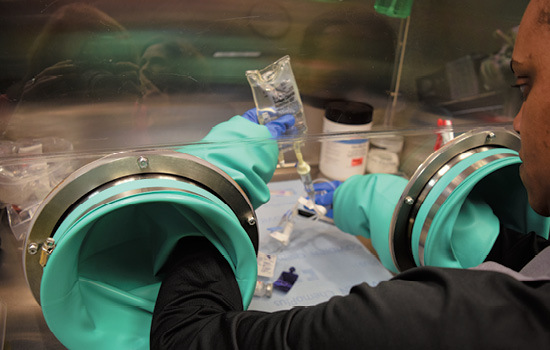 Individualized prescriptions of immunotherapy drugs are mixed in a sterile environment in a specialized pharmacy. A decade ago, there were few effective treatment options for patients with advanced melanoma or lung cancer. That's changing, thanks to new immunotherapy drugs which can unleash a patient's own immune system. An Emory scientist's groundbreaking discoveries pointed the way to the new therapies, and Winship clinical investigators have been involved in clinical trials of almost every immunotherapy drug approved by the FDA. While patients benefit from an increasingly wider range of treatment options, Winship clinical and laboratory investigators take on the challenge of making these therapies even more effective. In 2014, Danny Foshee experienced a sudden onset of extreme chest pain. He thought it was his heart, but a CT scan identified abnormal spots on his right lung. Biopsy results showed non-small cell lung cancer. His local oncologist ordered a PET scan and tumors lit up like Christmas tree lights. The largest was the size of a baseball. With cancer too advanced for surgery, a clinical trial was recommended. Soon after, Foshee met with Suresh Ramalingam, Winship deputy director and director of medical oncology, and Rathi Pillai, the medical oncologist who would become Foshee's primary Winship physician. After reviewing his case in detail, they asked Foshee if he would like to be considered for a clinical trial under way at Winship that compared the effectiveness of traditional chemotherapy which—directly attacks cancer cells but also other fast-growing cells in the body, such as hair follicles—and a new immunotherapy treatment designed to strengthen the immune system's ability to recognize and fight cancer cells. He was enthusiastic, as was his referring physician, but to be eligible for the appropriate trial, he needed to have one of three biomarkers on his tumor cells. Results from the first biopsies were negative. Then, only days before the trial closed to new patients, he tested positive for high levels of PD-L1. As Ramalingam and Pillai explained to Foshee, producing the protein PD-L1 is one way cancer outsmarts the immune system. On non-cancerous cells, PD-L1 signals the immune system not to attack. That can be very useful, for example, during pregnancy when PD-L1 plays an important role in immune system tolerance of the fetus. But when cancer cells produce PD-L1, its presence on the cells tricks the immune system into not recognizing an enemy that should be attacked. Patients with high levels of PDL1 in tumor cells—and in the immune cells surrounding lung tumors—often do not respond as well to treatment. The good news for Foshee, however, was that his high levels of PD-L1 made him eligible for a clinical trial studying nivolumab, a new drug which blocks PD-1, the receptor to which PD-L1 binds (see Ahmed sidebar). The study asked: in patients with high PD-L1 levels, would immunotherapy with a PD-L1 inhibitor work better than chemotherapy? Participants were randomly assigned to either immunotherapy or chemotherapy. Foshee drew chemotherapy, which meant he would receive the same drugs given patients outside of clinical trials. At first, he responded beautifully. Tumors shrank quickly. For a particularly large one pressing painfully on his spine, radiation oncologist Kristin Higgins recommended and delivered a course of radiation treatments. That tumor shrank in response to the therapy. Then, after two treatments, chemotherapy stopped working. The tumors took off again. Being in the clinical trial gave Foshee another option. He was switched to the study's immunotherapy arm. Every two weeks for the past year, he and his wife Coopie have driven almost three hours from Vidalia in South Georgia to Winship's infusion center. Two months after immunotherapy began, his tumors had reduced in size by half. Ongoing scans show increasing shrinkage and no spread of cancer. His worst side effect has been some itching. 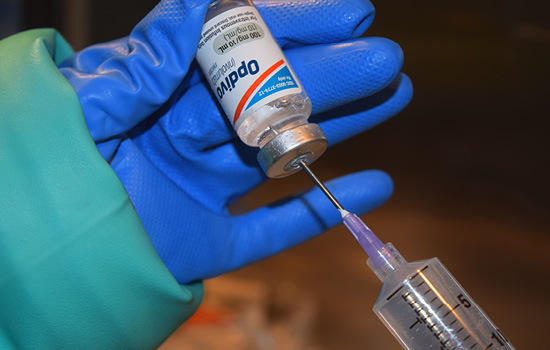 While the trial was still going on, the U.S. Food and Drug Administration (FDA) approved nivolumab for patients with metastatic non-small cell lung cancer resistant to chemotherapy, which described Foshee to a T. (Now known by its trade name Opdivo, nivolumab had been approved for patients with advanced melanoma a few months earlier.) Ramalingam, a national leader in clinical trials for lung cancers, led one of the two trials that spurred this go-ahead for lung cancer. Several other drugs recently approved for lung cancer also have gone through clinical trials at Winship under his direction. When the Foshees see ads for Opdivo on television, they justifiably feel pride in helping move such studies forward. They have a lot of company. Winship doctors see roughly 700 new patients a year with newly diagnosed lung cancer, and an increasing number of these patients are treated with immunotherapy, many in clinical trials. A re-energized Foshee is an inspiring example of why clinical trials are so important in the fight against cancer. Use of immunotherapy is likely to expand for lung cancer patients, says Ramalingam. Certain lung cancers are among the most responsive, equaled only by melanoma. Lung cancer has more mutations than many other cancers, providing more protein "hooks" for the immune system to recognize and respond to. While new drugs like nivolumab are game changers for patients like Foshee, there are many more patients for whom the drugs are not effective. Ramalingam's goal is to develop biomarkers to predict which patients will respond to which drugs and what can be done to turn nonresponders into success stories. He also wants to change the fact that immunotherapy currently is used only in advanced cancers. He leads the Thoracic Cancer Committee of the ECOG-ACRIN Cancer Research Group, a national federally funded organization that is launching a large clinical trial of immunotherapy to prevent recurrence in patients whose early lung cancer can be removed by surgery. That is just the kind of thinking Wally Curran, executive director of Winship Cancer Institute, wants to see happen. Curran says science has understood for decades that the patient's own immune system has the potential to control cancer. 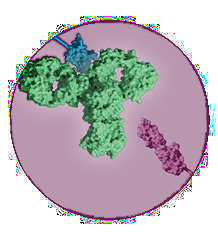 The earliest agents, like interleukin, were meant to stimulate and add to the immune system. This approach was effective to varying degrees but often with very high toxicity. In the last decade, he says, "we have discovered how to unlock the patient's own immune system, enabling T cells to identify cancer as a foreign agent—and we are doing it with less or no toxicity." He's excited by how fast the field is moving, but as amazing as the recent breakthroughs have been, and as proud as he is of Winship's role in bringing new drugs to market, he and his Winship colleagues aren't yet satisfied. Every advance brings new questions, such as why drugs work only for certain subtypes of cancers, and how responses can be made more durable. Today, says Curran, Winship is doing everything it can—by supporting new programs, acquiring new technology, and recruiting and mentoring new clinician-scientists—to make sure new breakthroughs come quickly. Twice Cathy McCoy was hours from surgery when things changed. 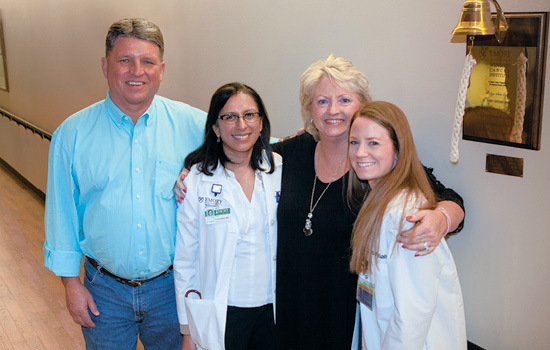 Two years ago, at a local hospital in the Tennessee mountains, she had been prepped for gallbladder surgery when a last-minute endoscopic exam revealed that the blockage of her bile duct—the source of her pain and jaundice—was not gallstones. At Vanderbilt, tests showed melanoma, an old enemy McCoy had successfully faced three times before with skin surgery. This time, the melanoma was internal, not on the skin. Surgery was scheduled the following week. But that morning, instead of being wheeled to the operating room, McCoy again found a surgeon at her bedside. We aren't going to operate, he said. The previous day's scans had shown not one mass but six, spread across her lung and lymph nodes. Referred to a Vanderbilt oncologist, McCoy cut to the chase. "What can be done?" Pause. "We have found," he answered, "that traditional chemotherapy isn't effective for metastatic melanoma. But there have been successes with immunotherapy. If you are willing to try it, I will find you the most appropriate clinical trial in the best hospital possible." "And if I choose not to try?" she asked. This time he didn't hesitate. "With that many masses, maybe nine months." As a medical resident in the early 2000s, Ragini Kudchadkar decided to focus on advanced melanoma. Friends tried to discourage her. There was little that could be done, they argued, once melanoma cells escaped the original site. 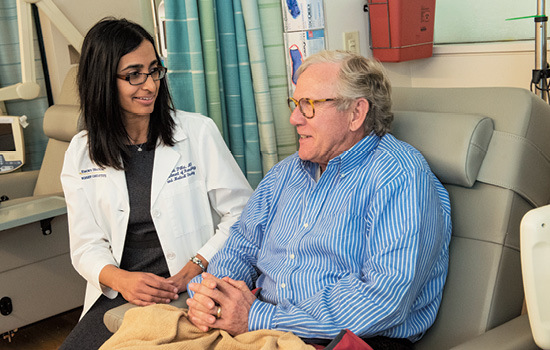 And indeed, in her first years in practice, Kudchadkar spent a lot of time talking to patients about end-of-life issues. But she was determined to take part in developing drugs for such patients, and during the past decade, with the advent of new targeted and immunological therapies, her conversations with patients like McCoy are often very different. When the McCoys arrived in Kudchadkar's Winship office in December 2014, they had just learned their only son Tyler and his wife Alexis were expecting a baby. The clock was ticking. Please, she said to Kudchadkar, please keep me alive long enough to see my grandbaby. Fortunately, McCoy was a perfect fit for a study at Winship, one of almost 20 for advanced melanoma. Earlier clinical trials at Winship and other leading National Cancer Institute centers had found that the immunotherapy drugs nivolumab and ipilimumab, given by themselves, produced strong response rates in some—but not most—patients with metastatic melanoma. Then a Memorial Sloan Kettering study tested the two drugs given together, achieving a response in more than half of patients. The finding was confirmed by studies at other leading centers, including one headed by David Lawson, director of Winship's melanoma team. The results were so good that even though the official trial ended in early 2014, a few top centers were given continued access to the drugs. Kudchadkar was heading the expanded access study at Winship. The McCoys listened carefully to an explanation of the study's possible risks and benefits. It's not a panacea, said Kudchadkar. It doesn't work for all patients. Go home and think about it. They shook their heads. Joe said, "We've already been through a lot. We are out of options. We know what we need to do." Cathy signed. A week later, they were back for her first infusion. Kudchadkar knew the drugs well. She and Lawson had been involved in the trials that led to ipilimumab's approval for melanoma in 2011 and nivolumab's in 2014. In fact, they have been involved in trials for every targeted and immunotherapy drug currently approved for melanoma. In fall 2015, the therapy given to McCoy became the first-ever combination immunotherapy approved by the FDA for use outside of studies. McCoy made the 500-mile round trip to Atlanta every other Friday for months, often accompanied by a family member or friend. It wasn't easy. Side effects included rash, fatigue, and severe headaches. Kudchadkar brought in an endocrinologist, In January 2016, proud of her contribution to the combined therapy study, she "graduated," ringing the bell that celebrates a patient's last infusion. Immunotherapy drugs are so new that it's hard to talk about long-term results, although Kudchadkar has patients from the original ipilimumab trials who have been doing well for approximately 10 years. As for McCoy, she counts every day an "abundance and blessing," especially since being able to babysit granddaughter Presley, born in September 2015. When the treatment of well-known patients makes the news, Kudchadkar's patients sometimes ask if they should be considered for the therapies they just read about. She smiles. "You got that five years ago when it was still in a clinical trial," she answers. 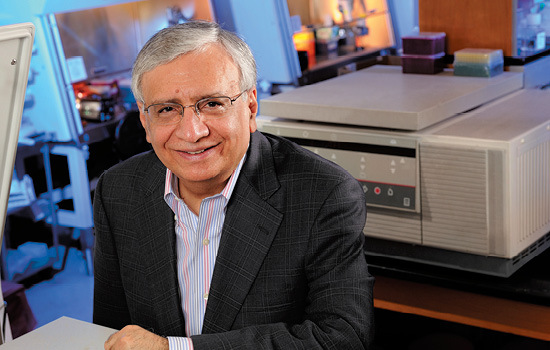 Development of the newly approved immunotherapy drugs taken by Foshee, McCoy, and other patients was greatly facilitated by the work of Rafi Ahmed, director of the Emory Vaccine Center and a Winship researcher. Ahmed didn't set out to study cancer. Internationally recognized for work on immune memory, he had sought to understand why memory T cells, so quick to respond to and remember acute infections, did not do well battling chronic infections like hepatitis C or HIV (human immunodeficiency virus). Accepted wisdom was that ongoing infection wiped out T cells. Not so. In 1998, Ahmed and then post-doctoral fellow Allan Zajac showed that in chronic infections the virus-specific T cells were still there but were "functionally exhausted." Checkpoint inhibitor drugs (represented in green above) block the PD-1, PD-LI interaction. In 2006, he and then graduate student Dan Barber discovered why: the central mechanism underlying functional exhaustion is high expression on the T cells of the inhibitory receptor PD-1, often referred to as an immune checkpoint. The signal that tells a T cell to turn off the immune response occurs because of an interaction between the PD-1 receptor and a protein called PDL1 produced by many normal cells. Chronic infection, the Ahmed team discovered, not only keeps stimulating the immune system (the presence of pathogens turning ON the immune response) but also increases levels of PD-1 on the T cells and PD-L1 on the infected cells (turning OFF the immune response). This continuous cycling exhausts the T cells fighting the virus infection. That was the brake on the immune system. Next, the Ahmed team showed that blocking PD-1 receptors removed that brake, an action which rejuvenated exhausted T cells and put them back to work. After the Ahmed publication, scientists across the country found exhausted T cells in humans with chronic infections. Cancer investigators made their own observations: T cells infiltrated tumors but didn't attack. 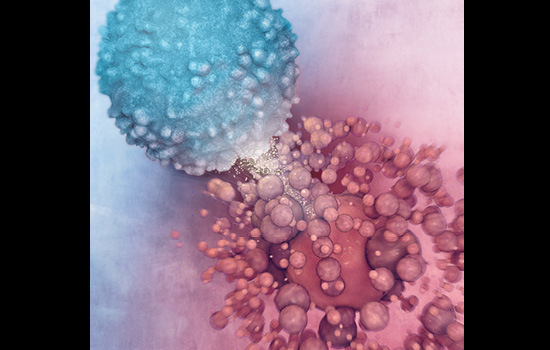 Cancer cells had figured out how to use the PD-1 checkpoint to their own advantage by producing high levels of PD-L1, slamming the brake on T cells’ ability to kill them. The discovery brought new energy to cancer immunotherapy research, especially development of PD-1 blocking drugs that would release that brake. Ahmed now collaborates with Winship clinical investigators. Suresh Ramalingam, Rathi Pillai, and he look for biomarkers in blood to tell how well PD-1 inhibitors are working in patients with metastatic lung cancer. Ahmed and radiation oncologist Mohammed Khan are exploring strategies that follow radiation therapy with a drug that blocks PD-1. In for melanoma and lung cancer patients with brain metastases, the team hopes the combination means the response of the tumors in the brain to radiation will be enhanced by stronger immune responses.